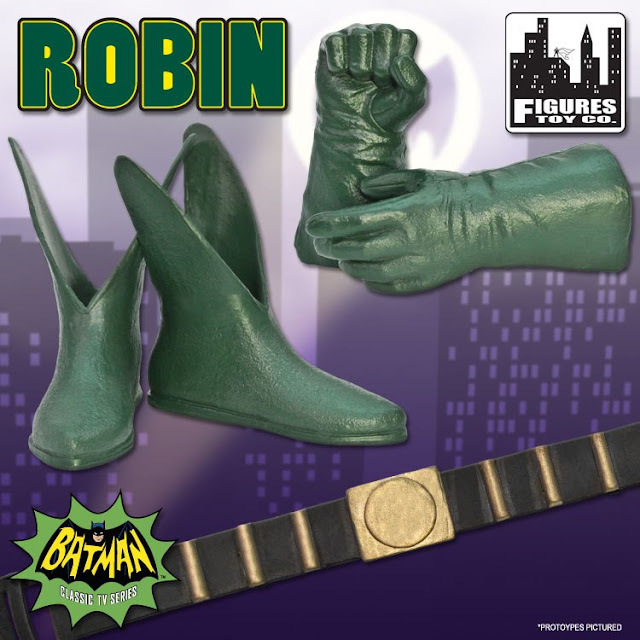 I don't know about the rest of you, but I think Figures Toy Co. is nailing it out of the park with their upcoming Batman TV Series action figures. We've recently seen the head sculpts for The Joker and Egghead in this series and I for one think they look fantastic. Wouldn't you agree? This latest sneak peek of the Burt Ward Robin action figure seems to be no different. Figures Toy Co. is really paying attention to detail in every way when it comes to these action figures. Best of all these figures aren't going to have oven mitts like their Mego counterparts. Do you want to see more? Stay tuned...The Batcave Toy Room will be posting additional pics soon as they are available. Cool! These will be great once they come out. I am so looking forward to these JBoy. If your dolly doesn't have oven mitts, then how will you know who is in charge of baking the crumpets? They told me you usually wear the oven mitts and that you make the crumpets from scratch. Well, I'm no slouch in the kitchen, 'tis true. That's what I've heard. So, get in the kitchen then and make us some crumpets.